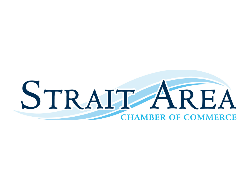 The Strait Area Chamber of Commerce is a business development organization that promotes, improves, and protects trade and commerce; and in so doing, ensures that the Strait Area is one of the best regions in which to invest, live, work and conduct business. The Chamber provides unique opportunities to promote and develop your business, through advertising, seminars, trade shows, and more. Behind every forward-looking community, there is an organization of energetic, broad-visioned men and women. The greatest natural advantage of any community is the organized leadership of its business people. The Chamber, through its numerous standing committees, gives you an opportunity to contribute your expertise. The Chamber is constantly working to make the Strait Area and surrounding communities a better place in which to live, play, and conduct business.